Section hair into a vertical section in front of the ear. Spray section with hair spray. Holding the curling iron clamp with your index finger (we prefer a 1.25-inch Hot Tools curling iron), clamp the section mid-shaft. Reach your opposite hand over to grab the rubber top of your iron, and immediately curl upward. Slightly loosen clamp grip on hair, and inch the curling iron downward. Then burl upward again. 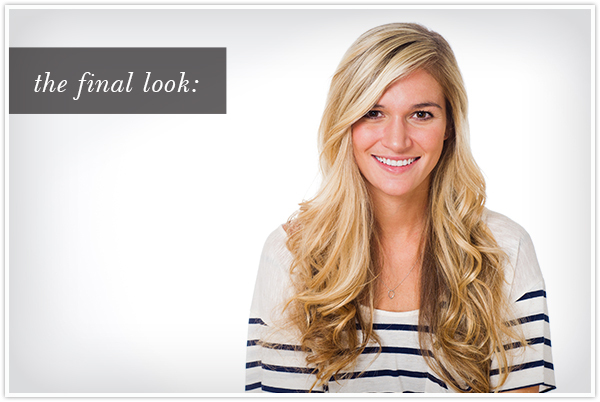 Repeat down the length of your hair section. Loosen clamp grip and release. Spray. Repeat steps 1 to 5 going around the head. Run fingers through your hair to break up the curls. Section hair into small sections around the crown. Wrap hair around the barrel of the curling iron (with clamp down). Repeat around the entire crown. Spray hair all over.